More people than ever are browsing the Web on mobile, so advertisers are making the move to mobile too. Google has noticed, so it’s announcing a refresh of its AdWords content to reflect this. Unveiled during an AdWords event today ,these ads are more interactive, based on swiping navigation rather than clicks, and rely heavily on high-res images. 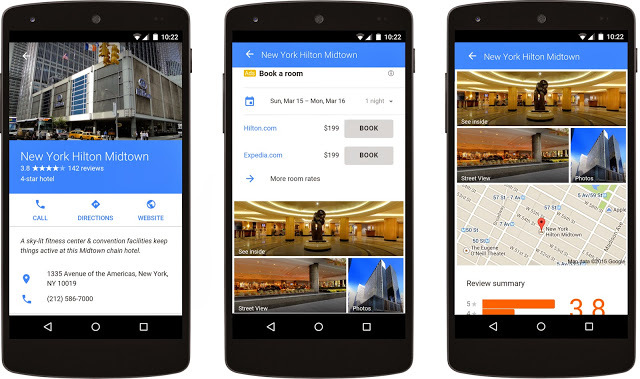 It’s a move that makes obvious sense, given the increasing popularity of mobile for search. Google says that there are more searches on mobile devices than PCs in ten countries, the US and Japan among them. There are also some new ad categories, including Automible Ads, which leads users towards a swipeable carousel of photos – something Google says acknowledges the fact that most users searching for cars are looking up images rather than links. When you tap on an image, you’ll see more information about the vehicle, including MPG, horsepower and nearby dealers. Hotels ads, meanwhile, will show current prices from various sources, as well as reviews and descriptions. Users can book a room right from the ad too. Google Compare – the company’s tool for finding the best rates among a variety of products – will soon support mortgages to help weigh rates and terms from multiple providers, as well as apply directly with one of Google’s approved lenders. Compare added support for car insurance in March. Mobile aside, there’s some new functionality on the backend too. A new reporting dashboard provides more insight and control over automated bidding for ads, while dynamic search ads are getting targeting based on your website’s content. For more on the changes today, check out Google’s announcement post below.